cyberREN's reporting features offer a combination of standard reports for most chart sections, designed for a multitude of purposes, as well as user defined reports, which address specific reporting needs at individual cyberREN sites. 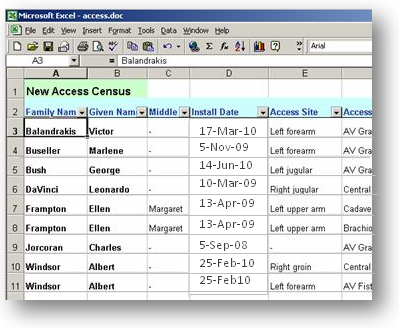 All reports can be exported into a data file, for further formatting or processing with a spreadsheet utility such as Excel®, a statistical package such as SPSS® or a Word Processor such as MS Word®. 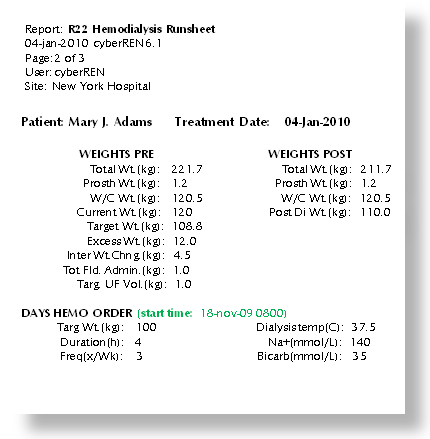 Lab results - reports in many formats are available, for example 1) organized by group for a specified date range (single or multiple patients), 2) months flow sheet for a single patient, 3) the most recent results for all patients in a specific treatment modality, 4) exceptions / alerts / abnormal lab results. Order Report - documents a single Physician’s Order for the paper chart. Progress Notes - a list of progress notes charted over the previous 3 months arranged in inverse chronological order. Event Summary - a list of significant events that have occurred within a specified date range. Hemodialysis Treatment - a guide for nursing staff carrying out a hemodialysis treatment including; hemodialysis prescription, medications to be administered, recent lab results, pertinent nurses notes. Treatment Summary - a summary of the completed hemodialysis session, including days prescription, dialysis log, heparin log, and other chart elements. Education Record - a list of all education records attended by the patient. Nutrition Record - a summary of the most recent information charted by the nutritionists. Transplant Workup - a list of transplant workup items for a specific patient, with the associated status.